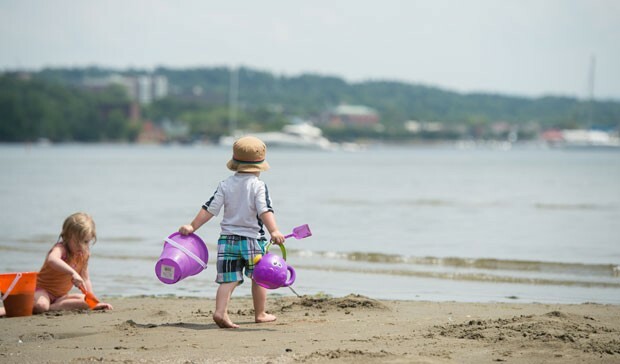 Vermont Day-cations: The Great Escape & the Burlington Waterfront | Features | Kids VT - small people, big ideas! If you live in Vermont, you don't have to travel far to find family-friendly summer fun — but sometimes you want to. This summer, we asked our Kids VT contributors to visit some of their favorite destinations, both in state and around the region. We shared their adventures in our June, July — and this month, August — issues. Looking for more day-trip ideas? Check out all of this summer's — and last summer's — suggestions at kidsvt.com. Eight years ago, my husband, Kevin, and I spent a romantic weekend ... at the Great Escape. Our idea of fun has always been a little offbeat — we enjoy planning for the zombie apocalypse, for example — and I look back at that trip with particular fondness. We'd just begun dating, and I remember holding hands and discovering a shared passion for kettle corn. In June, we decided to return — with our 4-year-old son, Oliver. Alas, the hand holding had a different purpose this time around. 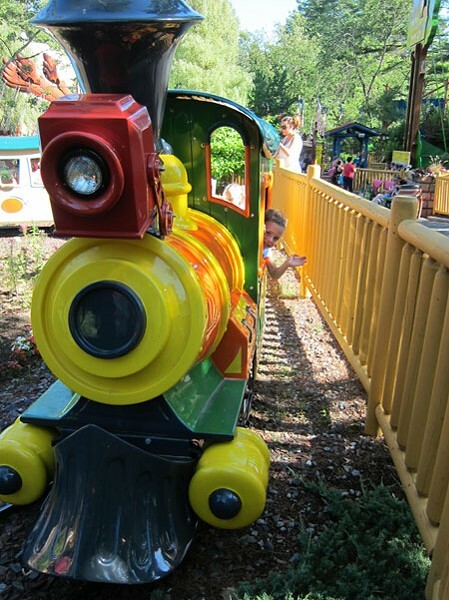 Coming back with Oliver and Kevin, whose own parents brought him when he was a boy, I was more interested in the park's long history as a family destination: It opened as Storytown USA in 1954, and became the Great Escape in 1983. It's changed, as we have, but retained its roots. The park is still full of thrill-ride fun. The Boomerang roller coaster shoots riders through loops and corkscrews, and the Mega Wedgie waterslide drops them down a 100-foot tunnel for a swirl around a giant bowl into the pool below. Its best-known coaster, the Comet, actually predates the park. 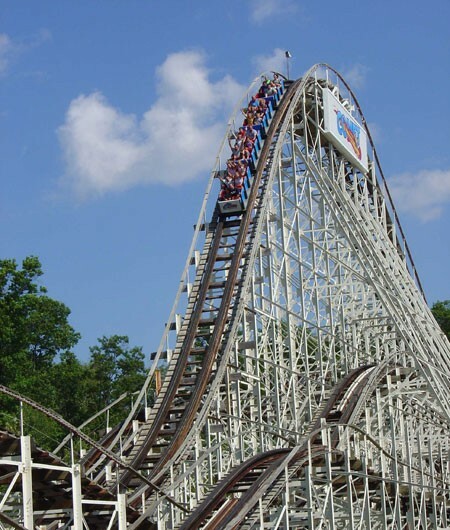 The 80-year-old wooden behemoth, featured on MTV's "Road Rules" and Discovery Channel's "Wild Rides II," was originally part of the Crystal Beach Amusement Park in Ontario before the owner of the Great Escape bought it and installed it in the New York park in the early 1990s. My son, Oliver, looked longingly at the screaming kids on these hair-raising rides, but I was secretly relieved he didn't meet the 48-inch height requirement — I'm not a roller-coaster fan. I was also psyched about the number of rides he was big enough for, including Frankie's Mine Train, a gentle coaster on which he went solo, lighting up the ride with his 1000-watt smile. The Timbertown section is full of stuff for adventurous tots, and includes an area with refreshing water sprays appropriately sized for the smallest sweaty kids. Interestingly, though, Oliver was drawn to the oldest parts of the park: the Storytown buildings. These pint-size stores, tack shops, banks and butcher shop are remnants of the park's original incarnation. Oliver loved pretending to lead a class while sitting at the teacher's desk in the schoolhouse and "escaping" through the jail's wrought-iron bars. Splashwater Kingdom, one of the Great Escape's newer features was a hit with us, too. It was the hottest point of the day when we arrived at this outdoor water park, which is not to be confused with an indoor water park nearby; when Paul Bunyan's enormous bucket tipped over and drenched me, it was a welcome relief. My only regret: The glare off the bright-white pool bottoms in Noah's Sprayground made me regret leaving my sunglasses in our rented locker. A few words of advice: The $14 locker is worth the price, but it's not the only expense you'll incur during your visit to the Great Escape. If you go, bring plenty of cash. In fact, you may need a small loan to underwrite your New York adventure. We got advance-purchased discounted tickets for $41.99 each, paid $18 for parking, dropped $14 on a locker, and ate an unimpressive lunch of fries, soda and chicken strips that cost about $30. After seven hours and 15 rides, we headed home. I pestered Oliver for his backseat opinions, but all I got were snores. The Great Escape is open daily from late May to early September. 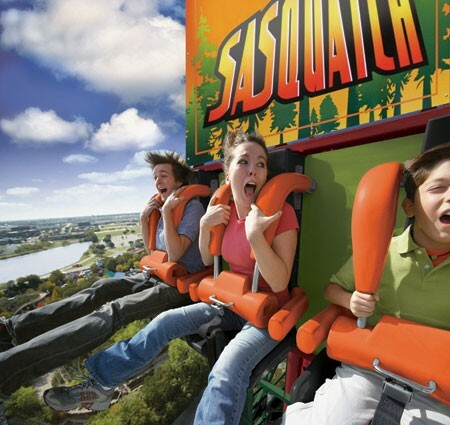 The park is also open on weekends in September and October. 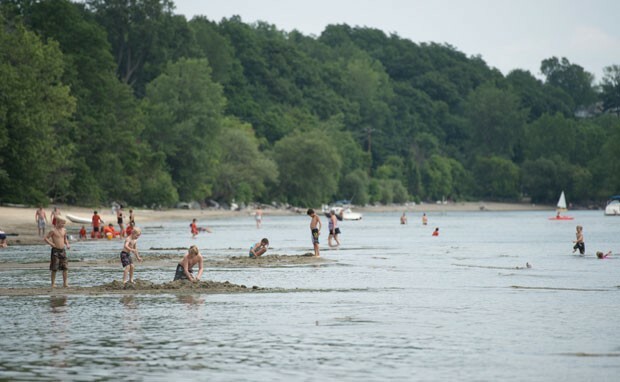 Many people head into the park wearing bathing suits, which is not a bad idea since you'll eventually want to cool off. Want to carry your suit? Rent a locker near the water park; the bathrooms there have a changing area. General admission prices: adults, $51.99; kids under 48 inches, $41.99; children age 2 and under, free. One-day-advance, online-purchased ticket prices: $41.99. Three-day-advance, online-purchased ticket prices: $38.99. Parking is $18 a day. Some activities in the park, such as the "skill" and arcade games, are not included in the admission price. No outside food or drink is allowed in the park, but our backpack was never searched, so I wish I'd snuck in a water bottle or two. The Alpine Fest Haus and the Timbertown Café & Marketplace offer healthy meal options. Get a sandwich at the Skillet Market or chicken tenders at the Chicken Chalet. There are also food options at Splashwater Kingdom, including a grill, pizza parlor and ice cream stand, so don't leave your wallet in the locker. The Great Escape is about two hours from Burlington. We made it a day trip, but you might want to stay over. For lodging, VT Mamateurs — vtmamateurs.com — recommended the Country Inn & Suites. It offers free breakfast, has an in-ground pool and is within sight of the park. Rooms run $190 to $310 for a package that includes Great Escape tickets. Country Inn & Suites, 1130 Route 9, Queensbury, N.Y. Info, 800-830-5222, countryinns.com/queensbury-hotel-ny-12804/nyqueens. The Great Escape Lodge, right next door, is home to an indoor water park that makes it a great winter getaway. The Lodge offers packages that include admission to the Great Escape as well as the indoor water park, but they're pricey: $250 to $600 per night depending on the size of the room and number of tickets you want. Great Escape Lodge, 89 Six Flags Drive, Queensbury, N.Y. Info, 518-824-6060, sixflagsgreatescapelodge.com. Just north of the Great Escape are the Factory Outlets of Lake George, more than 70 stores within a half-mile, walk-able radius. It's not exactly a kid activity, but mom and dad deserve some fun, too. You can hit the Children's Place, OshKosh B'gosh and Gymboree, along with DKNY, Nine West and J.Crew. Info, factoryoutletsoflakegeorge.com. If the Raging River was your favorite part of the Great Escape, check out Adirondack Tubing Adventures in Lake Luzerne, about 20 minutes from the park. They offer guided floating trips for families on tubes, rafts or kayaks. Info, 518-696-6133, adirondacktubing.com. I grew up in Southern California, where I was building sandcastles before I could walk and boogie boarding before I could ride a bike. My 10-year-old twins have also spent countless summer days frolicking in the Pacific, playing in the sand. I wasn't about to let a move to Vermont interfere with raising my two beach kids. I am pleased to say we have already found a few great sandy spots here in Vermont, but we have had to adjust to something you never experience in Southern California: changeable weather. After packing up lunch, umbrella, beach chairs, hats, sunscreen, balls, books and buckets ... it pours? I quickly realized that in Vermont, every beach trip needs a plan B. 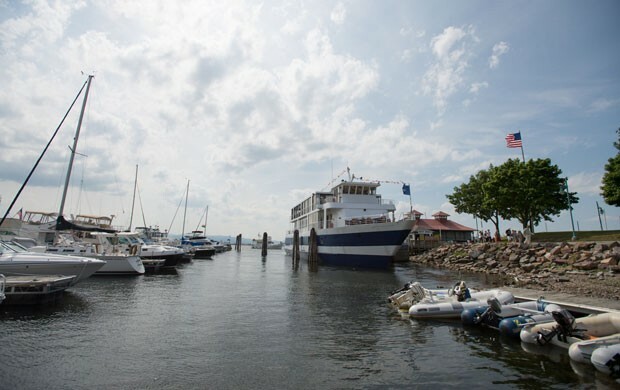 When clouds threatened to spoil our first trip to North Beach in Burlington, I went straight to my backup plan: a scenic cruise on Lake Champlain aboard the Spirit of Ethan Allen III. My kids love boat rides of any kind, and with inside and outside seating on three decks, I figured we could avoid getting wet while being on the water for an hour and a half. As we boarded the ship, the kids were amazed to look down and see fish swimming in the harbor. Just moments later, they were even more excited by the kid centric options at the snack bar: hot dogs, chicken wings, burgers, nachos. The fact that I refused to order even water did not deter them from studying the menu so intently, they didn't even notice when the boat started to move. I settled into my plastic deck chair, listened to the canned narration and took in the scenery. The mellifluous voice of the narrator ("cheesy," according to my daughter) provided a mix of Lake Champlain history, local geology, lake facts and a little Champ lore. It was the consummate tourist experience, and as a new resident, I found it to be a good family activity on a stormy summer morning. My kids enjoyed exploring the two upper decks of the ship while they watched the Vermont and New York shorelines glide past. The rain came and went faster than you can say Samuel de Champlain. By the time we got back to the Burlington Community Boathouse, the sun was shining again and we resumed plan A: the trip to North Beach. In theory, we could have ridden our bikes — or rented some from Local Motion — for the mile-and-a-half ride up the Burlington Bike Path. But I'd packed way too much stuff for an afternoon at the beach, so we drove — and paid the $8 nonresident fee to park at North Beach. It was a Monday afternoon and, despite the suddenly gorgeous weather, the beach was relatively empty. We spread out on the sand, which was more like construction-grade sand than the soft white stuff we are used to. The turkey sandwiches I packed were a far cry from the tantalizing nachos aboard the Spirit of Ethan Allen III, or a hot dog from the North Beach snack bar about 100 yards down the beach from where we were. But they were easier on the budget and, I'd like to think, better for the kids. After lunch, the twins headed for the warm, shallow water, where they entertained themselves splashing and racing and scanning the lake bottom for treasures. I tackled the Sunday New York Times crossword and did some rather shameless people watching. After about 20 minutes, I concluded that I could have been at any beach anywhere: toddlers were building sand castles, teens were tanning and texting, gulls were tormenting beachgoers, all the lifeguards looked bored. There were even some stand-up paddleboards to rent. The only differences between Burlington's North Beach and one in Southern California? Less intense waves — a relief since I didn't feel nearly as anxious about the kids getting swept under — and an absence of breast implants. A few hours later, as clouds started rolling in and a battalion of camp kids arrived on the sand, we decided to pack up. Driving home, I swung into the Burlington Bay Market and Café parking lot, where they serve the best creemees in town. We ordered at the window, found an empty table on the patio and licked creamy dairy sweetness in contented silence, watching the Spirit of Ethan Allen III embark with a new group of tourists. "But maybe we should go to ECHO too," I added, having learned a thing or two about summer on the west coast of Vermont. Scenic cruises on the Spirit of Ethan Allen III run 1.5 hours and cost $17 for adults; kids, $9. Tickets can be purchased online or at the dock; there's a $2 coupon on the website. The ticket kiosk and boat dock are at the bottom of College Street in Burlington. Info, 862-8300, soea.com. You pay a flat fee to park in the Burlington Waterfront lot: Queen City residents, $6; nonresidents, $8. Reentry is allowed, or you can find a metered spot on a nearby street for $1 per hour. North Beach is located at the end of Institute Road, off of North Avenue, by Burlington High School. Parking — the lot is open from 9 a.m. to 9 p.m. — costs the same as it does on the Burlington Waterfront. The beach has a playground, snack bar — open from 11 a.m. to 6 p.m. in the summer — picnic tables, grills, restrooms, grass areas and foot showers. Canoe Imports rents kayak and stand-up paddleboards. Info, 651-8760, canoeimports.com. ECHO Lake Aquarium and Science Center is a great rainy-day option. Open 10 a.m. to 5 p.m. daily, ECHO ticket prices are as follows: adults, $12.50; children 3-17, $9; find a $1 coupon on the website. ECHO, 1 College Street, Burlington. Info, 877-324-6386, echovermont.org. If you want to explore the bike path, but forgot your ride, rent one at Local Motion: Adult bikes are $25 for 4 hours or $30 for a full day; kids bikes, trailers or tag-alongs are $20 for 4 hours, $22 for a full day. Rentals are first come, first served, but full-day rentals can be reserved using a credit card over the phone. Info, 652-2453, localmotion.org. Burlington Bay Market and Café offers sandwiches, soups and salads inside and on a patio overlooking the lake. 125 Battery Street, Burlington. Info, 864-0110, burlingtonbaycafe.com. The Skinny Pancake serves sweet and savory crépes all day. 60 Lake Street, Burlington. Info, 540-0188, skinnypancake.com. ECHO's Café is run by Sugarsnap and offers panini, hot dogs and salads as well as grab-and-go items. Find a menu on the ECHO website. Museum admission is not required to eat in the café. 1 College Street, Burlington. Take the free College Street shuttle up to the Church Street Marketplace and shop, eat or see an art exhibit at the BCA Center. The shuttle runs daily in the summer; find schedule information online at cctaride.org. The BCA Center is located at 135 Church Street. Info, 865-7166, burlingtoncityarts.org. Ride south on the bike path to see the Burlington Earth Clock and the handicapped-accessible treehouse at Oakledge Park, at the end of Flynn Avenue.